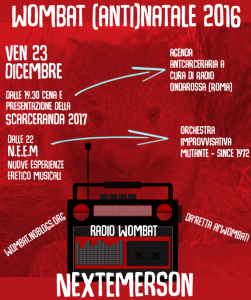 ore 21 Presentazione di Scarceranda 2018 a cura di Radio Onda Rossa (Roma). 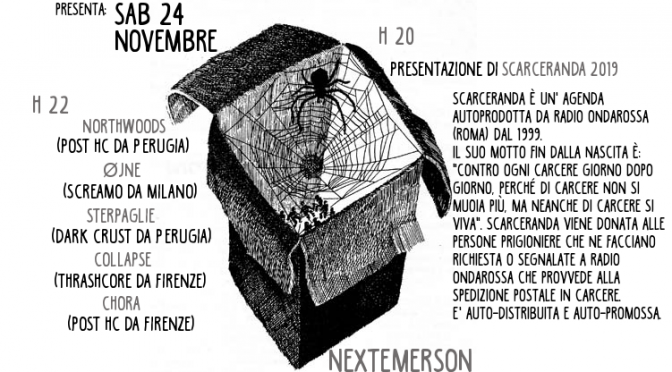 Performance di cinema re-inventato e artigianato in pellicola. 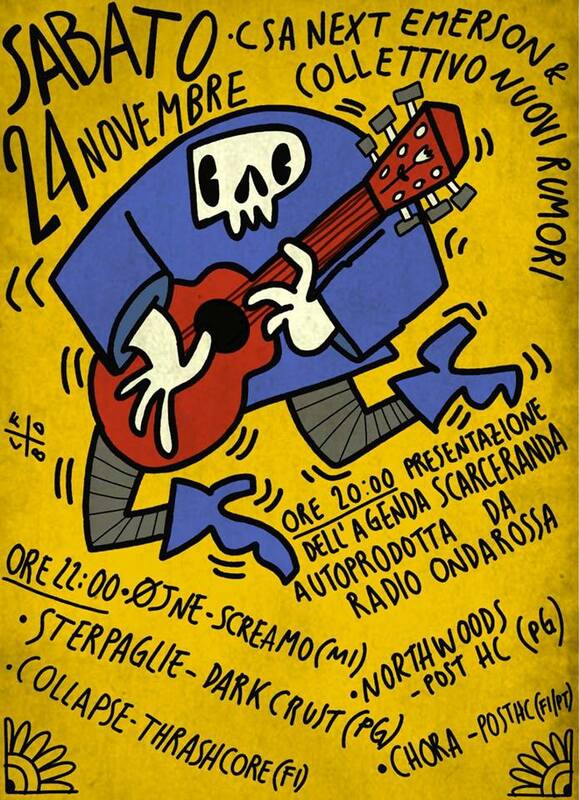 Scarceranda e’ un’agenda autoprodotta da Radio Onda Rossa dal 1999. 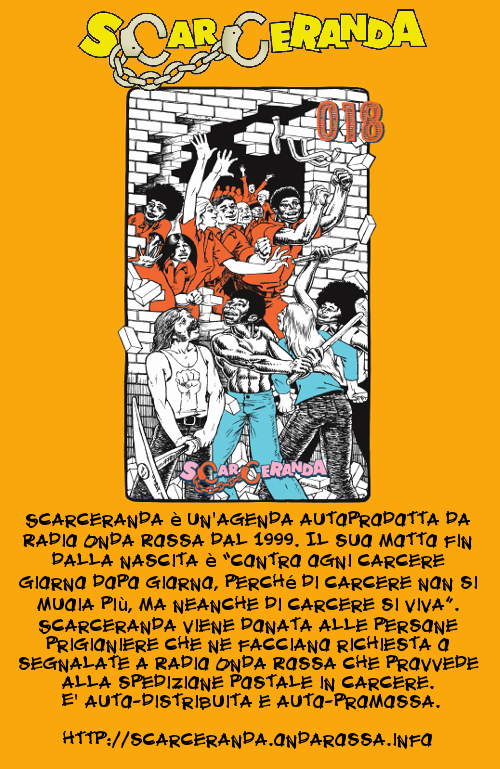 Il suo motto fin dalla nascita e’ “contro ogni carcere giorno dopo giorno, perche’ di carcere non si muoia piu’, ma neanche di carcere si viva”. 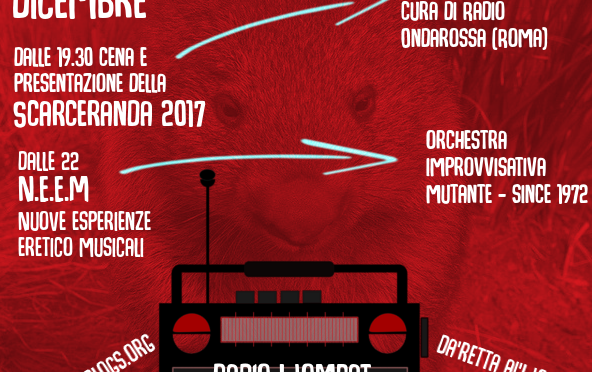 Scarceranda viene donata alle persone prigioniere che ne facciano richiesta o segnalate a Radio Onda Rossa che provvede alla spedizione postale in carcere. E’ auto-distribuita e auto-promossa. 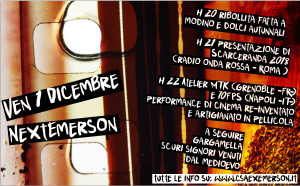 Lo storico Atelier MTK e’ un laboratorio cinematografico artigianale che dal 1992 inventa nuovi strumenti per mettere in scena e sviluppare una diversa pratica di cinema. Images are made of colored potatoes starch. We juggle the constraints of the unique, fragile image, difficult to reproduce and almost anti-cinematographic, of the Autochrome process invented by the Lumière Brothers, to adapt upon supple film. Wave behavior (Comportement d’onde) by Lewis and Cloïc – Film without film – sound and light 2 x 16mm projectors – 30 min Improvised performance for two 16mm projectors played by Lewis & Clovic. The projectors become animals of film-free projection. The raw light, arriving 24 pulses per second, is ceaselessly sculpted to create form and movement. 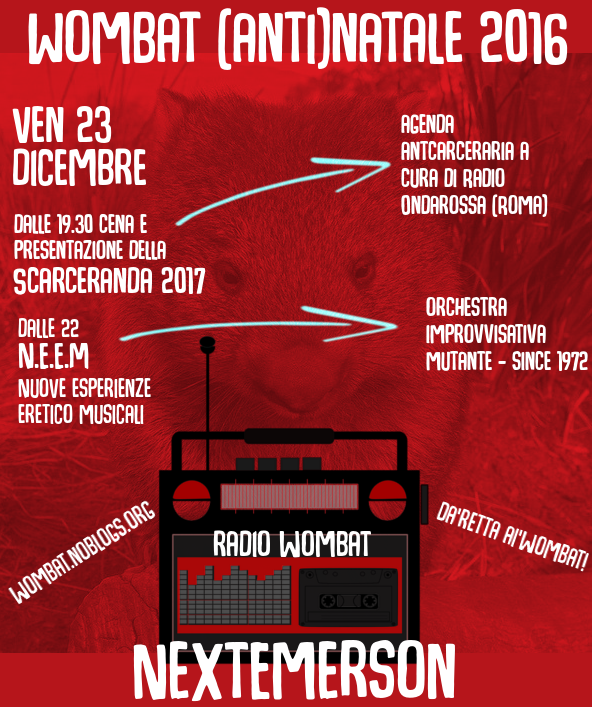 We play with pre-cinema for a Space-Noise Opera with optical manipulation and light beam trituration… an audio-kinetic fiction of four hands. Simulacra are sent and dispersed in every direction, but because we see only with the eyes, it occurs that, where we turn our gaze, it in that moment that all the objects strike it with form and color. In that instant the emitted image pushes forward and advances the layer of air between it and the eyes… this chased layer of air thus bathes our pupilles and passes on. All of this must naturally occur with a prodigious rapidity. A 30 minutes performance in which RIojim plays with his 16mm projector in an instrumentist gesture, creating deep breath out of a frenzy chromatic flush of celluloïd, the projector singing it’s uncanny, sometimes funny, 50 hertz lullaby. 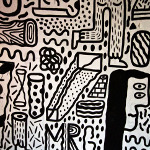 Riojim works at Atelier MTK in Grenoble – France, where he teaches DIY film processing. He is particularly attracted to abstract animation, the pleasure of physically modifying images on the film via twisted and other chemical treatments frowned on by professional labs. Involved in experimental film for 20 years, Riojim have been a member of the 102, a venue dedicated to experimental arts, hosting most of the foremost improvisers of new music. 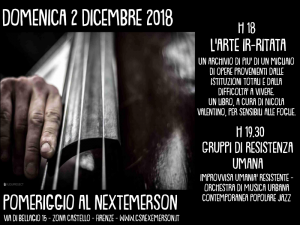 It is natural that his art culture and sensibility turn him toward the practice of improvisation which he understand as a quick and profound reaction to events where each performance is constructed for a particular time and place. Citing Jim Denley, he also believe that exploring the moment of creation – when an idea, feeling or gesture is first expressed – is to take part in the most exciting adventure possible, not only for the artist but also for the audience ! 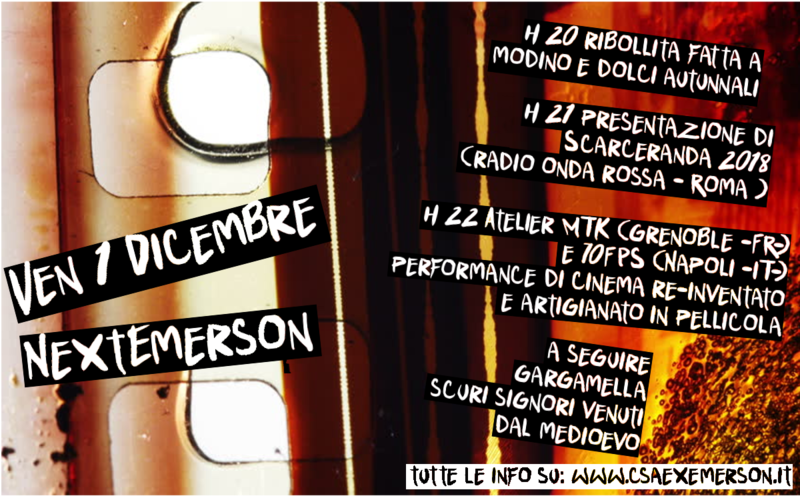 70FPS is Andrea Saggiomo: amplified super8 projectors, home-made films and photosensitive self-made electroacoustic devices. A double screen super8 projection in which sounds are produced by the difference of contrast between the images on the films. 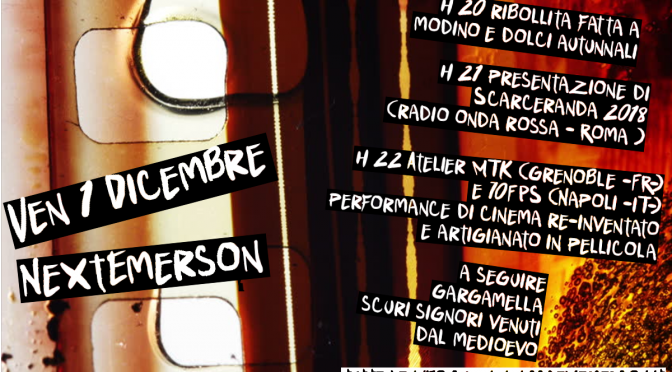 The super8 projector, the film and the image are used as instruments to produce and modify in real time the light and, using some self-made photosensitive sound devices, the sound. Flat-printed and hand-processed super8 films are prepared by scratching and patching, piercing and ink drawing to be used in a multiple projection at different speeds. The projectors and their internal mechanics are also used as sound producing objects in relation with voice and electroacoustic stuff. I’m trying to reflect on memory, actually my visual memory of my friends faces and movements. The film materials and the process of images creation gradually deteriorate… what remains of the images are some sort of ruins that eventually shine in my mind and produce noises…. 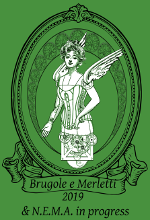 Mirabolante duo che propone atmosfere medioevali al profumo di zolfo senza disdegnare una certa modernità come ingradiente segreto delle proprie stregonerie. 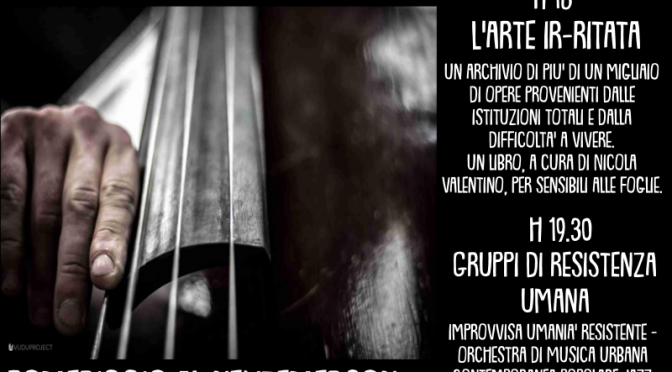 Dove strumenti antichi si uniscono a ingranaggi del nostro tempo in perfetta armonia oscura. 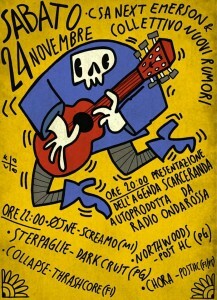 Siamo contentissimi/e di averli di nuovo con noi. 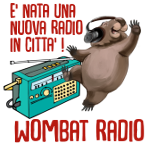 Ven 23 dicembre – Wombat(anti)Natale!